Death is not something most people enjoy talking about. But the reality is, that someday we all have to go. And we can’t take our hard earned money and possessions with us. It’s going to go to someone. Most of us hope that our wealth will be passed on to our families – or perhaps go to a cause that we believe in. 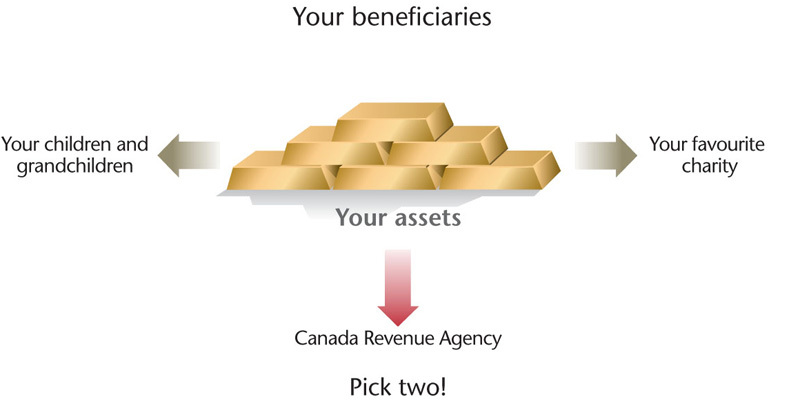 Taxes and estate laws in Canada being what they are, however, a good portion of your estate could go to the government instead. Wouldn’t it be great if we could change that? The good news is, as long as you are healthy – you can. When I purchased my new home in London, Ontario in 2005, I chose to accept the mortgage insurance from my mortgage provider. It just made sense to protect such a large investment. I later discovered that mortgage insurance mostly benefits the bank and might not pay out to either my wife or I should one of us pass away. There is a CBC Marketplace1 show dedicated to the limitations of mortgage insurance. In some instances, mortgage insurance does not pay out at all if you have any pre-existing health issues. When you accept mortgage insurance you are not fully underwritten so you are never completely sure you qualify for the coverage. This can be very troubling for your family when you are gone. The first life insurance policy I bought was a term policy back in 2006 with my wife. I love my spouse and wanted to make sure she was provided for in case I was no longer around. We chose a joint-first-to-die policy so that both of us were protected. An insurance salesman helped us apply for our first term 10 policy and explained the difference between mortgage insurance and life insurance. In addition, we discovered that the cost of owning our own policy was actually less than what we were paying for our mortgage insurance at the bank where our mortgage was held. We went through full health checks with an insurance company to qualify for this new term 10 coverage and once we were awarded our new policy we cancelled our mortgage insurance with our bank. Life insurance is applied for mainly by people who would like to protect their loved ones from the loss of income and to pay off debts like a mortgage. Other reasons for life insurance include covering final expenses, paying outstanding estate taxes, funding children’s education, leaving a legacy to a favorite charity, paying creditors, protecting key people in your business and transferring your wealth smoothly and efficiently to your heirs or business partners. The reason for life insurance changes with age. When you are young and single you buy life insurance in anticipation of having a family one day or to pay off debt. When you get married you like to protect your spouse and when children come along to protect your extended family. When you get older and get nearer your retirement years you start to think about using your life insurance policy to provide additional money for emergencies, long-term care, estate equalization (make sure each child gets their fair share), and to lower your final estate costs. Who gets my wealth after I die?